Good morning, all! Thank you for being patient while I moved out of college these past two days. It's a VERY daunting process, though was depressing because it was the last time I will ever do it. I'll be commuting when I do attend law school, so no more moving into dorms for me. Today, I have a brand that is near and dear to my heart. I initially found them while searching for vegan-friendly nail polishes for my best friend. And I'm pretty sure that in the end, I fell in love with them even more than she did! 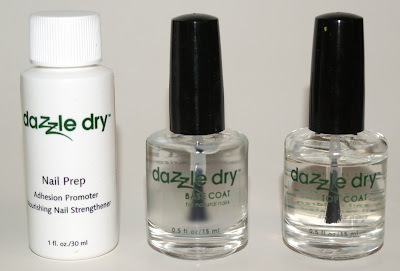 Dazzle Dry features a 3 Piece Nail System that comes with Nail Prep, Base, and Top Coat. First, I applied the Nail Prep with a cotton ball to help remove oils and any other residue on my nail. This, according to Dazzle Dry, helps promote adhesion and strengthens your nail. Then, I applied the sticky base coat. It felt a little bit weird because it is VERY tacky, so it's not the kind that dries to the touch within a few moments and you can walk out of the room and go about your business if you need to. Of course, I then applied the top coat over the polish. Now, I think you all know that Seche Vite is my holy grail of top coats because of my constant problem with smudging my nails. It is all that I use. Well, until now. The Dazzle Dry top coat is the most impressive top coat I have EVER used. Not only does it dry ANY polish or nail art in 5 minutes or less, it never causes bubbles or shrinkage. EVER. I will honestly never use anything else again. Especially considering after two weeks, all I had was tip wear. Not a single chip. Or ding. Or anything else. I think I'm in love. And here are the polishes! The two colors above are Cherry Parfait and Silver Lace texture. First up is Cherry Parfait, a BEAUTIFUL dark rose pink. The application on this was smooth as butter and it was opaque in just two coats. And here is the look of the Silver Lace texture over Cherry Parfait. I applied a very thin coat, but it didn't seem to separate as much as I'd have wished. I'm not a big fan of the crackle trend, but did like the pearlized look of Silver Lace. I would probably just wear Cherry Parfait out on its own. Dazzle Dry Nail Lacquers retail for $9.00 and each bottle contains .5 fl oz. of polish. The Dazzle Dry 3 Piece Nail System retails for $28.50. All polish is vegan-friendly and 3-free! 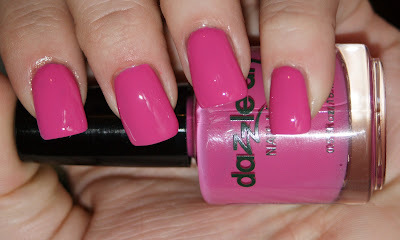 Please be sure to visit Dazzle Dry on Facebook and check out their array of awesome colors on their website! Be sure to get that top coat!